Accompanying Kickstarter Update #85 was a brand new battle scene image, and in this post we will be polishing up our spectacles to see what details it contains. 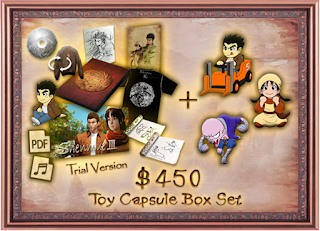 A $450 Toy Capsule Box Set reward is now available as an upgrade or add-on via the Shenmue 3 page on the Fangamer site. 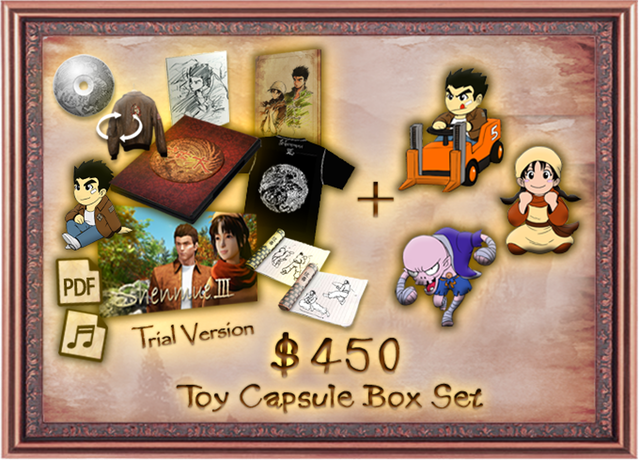 With this reward, you get all four capsule toys that will actually appear in the game: Ryo, Shenhua, Chai and Forklift. The $250 reward is included. (July 28th update: Fangamer has indicated to a backer that the illustration in this $450 upgrade / add-in will be signed by Yu Suzuki, as was the case with the Kickstarter campaign reward. 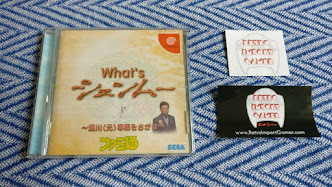 See this post on the Shenmue Dojo forums). Regarding the content of the PC & PS4 physical disc versions of the game, the following information was given: "Development is moving forward to have all necessary data to play the game contained on the disc. 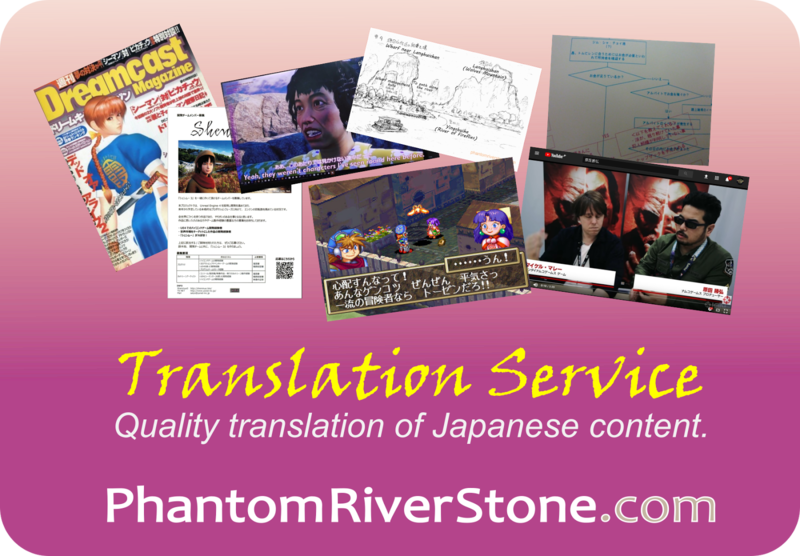 Please rest assured that the disc will not be just a prompt for an internet download." It was noted that an internet connection will be needed for game updates and reward activation. Over $7 million in pledges have now been received. 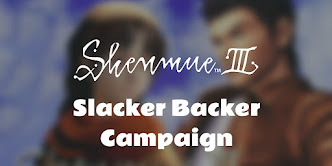 The total pledged amount through Kickstarter and Slacker Backer combined is now $7,063,329 (as of July 20th). This means that the stretch goal of "AI Battling" has officially been reached. To read more about what this goal entails, see our post The AI Battling Stretch Goal. For the full text of Kickstarter Update #85, visit the official page. Now to the main topic of today's post: a close look at the battle scene image. The image is shown below and is a high-resolution version which shows the detail more clearly than the one in the update. (Tap to enlarge). As can be surmised from the darkened windows and the stars that can be seen outside, the scene takes place at night; Ryo is shown taking on a group of five enemy NPCs inside a large warehouse that is illuminated by lights overhead and fires burning in drums and braziers placed around its interior. Stars can be seen shining in the dark sky outside. 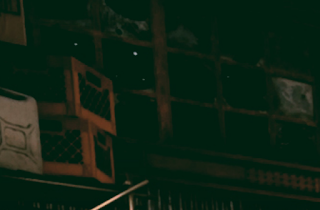 The image is packed with details and lighting effects: beams of light streaming through the dusty air; grubby stacks of crates and industrial equipment against the walls; and shadows cast by the characters and objects onto the floor. For the rest of the post, we'll talk about several specific points of interest. 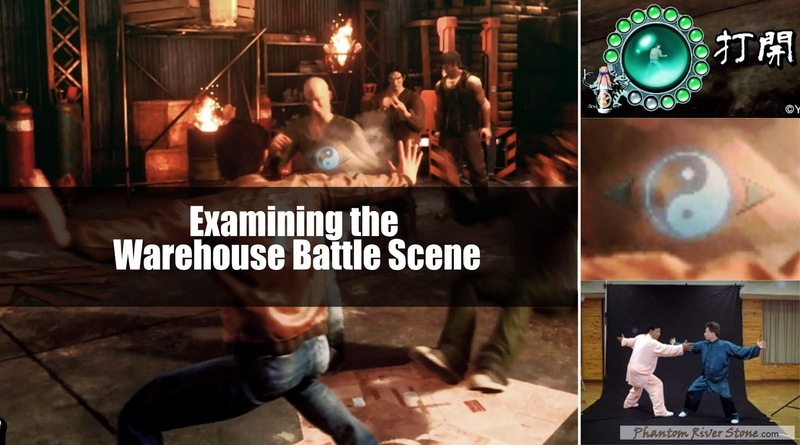 Starting with the general atmosphere of the high-ceilinged warehouse, it strongly recalls this image that Yu Suzuki shared at MAGIC 2018 ("4 New Screenshots from MAGIC 2018"). While the layout differs, several elements such as the corrugated-iron walls, window frames, gas bottles, cabinets and firey drums are recognizable as being shared between the two images. This suggests the possibility that we may be seeing the same warehouse, or one close by. 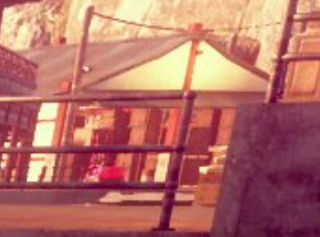 A warehouse was visible in the distance in a screenshot of the riverside city of Choubu shown at the MAGIC 2018 press conference ("Examining the 3 New Shenmue III Screenshots | MAGIC Press Conference"), and this seems a likely location for these scenes to take place. 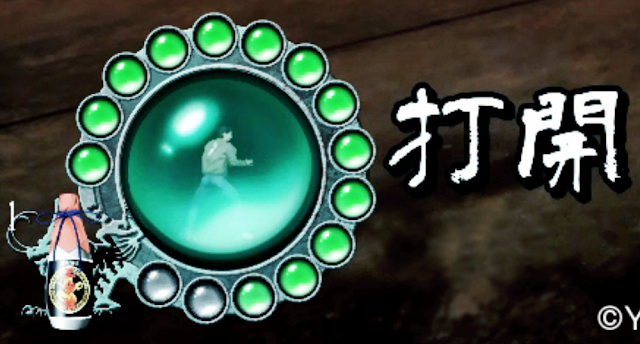 Ryo's maximum strength consists of 15 round indicator segments, an increase over the 12 in the first two Shenmue games. 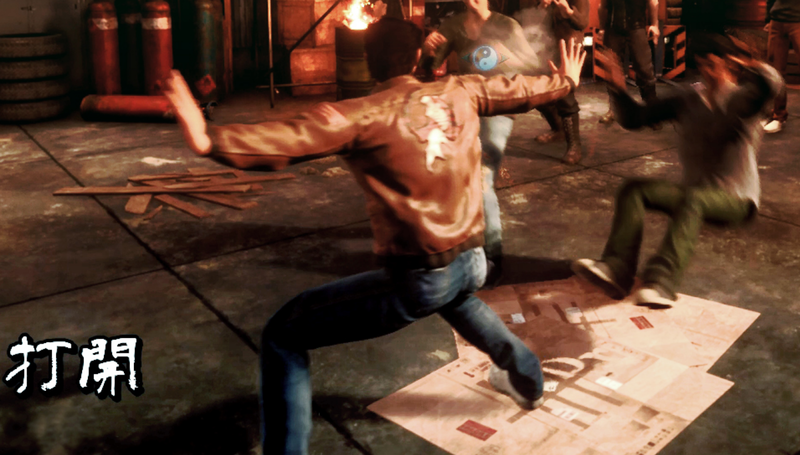 In the center, in place of the dragon motif from the previous games, we see an image of Ryo taking up a stance; one that is not a simple reflection of his actual pose. 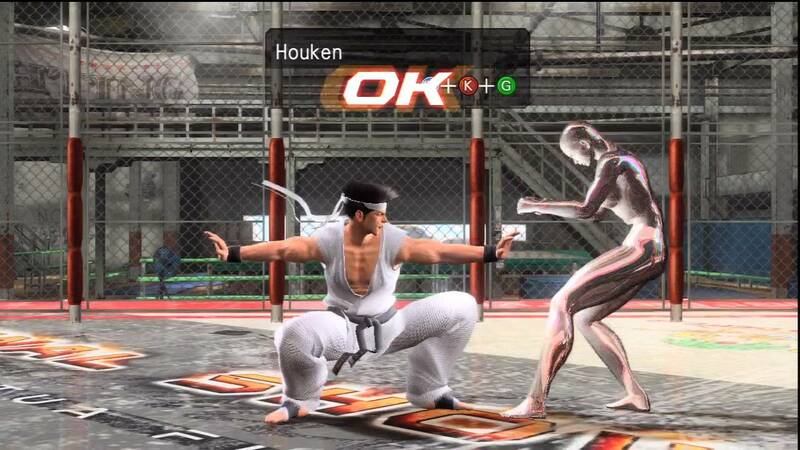 Some fans have proposed that this may represent Ryo's current "battle style" whereby his style can be switched among a certain set, allowing the player to determine their preferred mix of balance, speed and power. 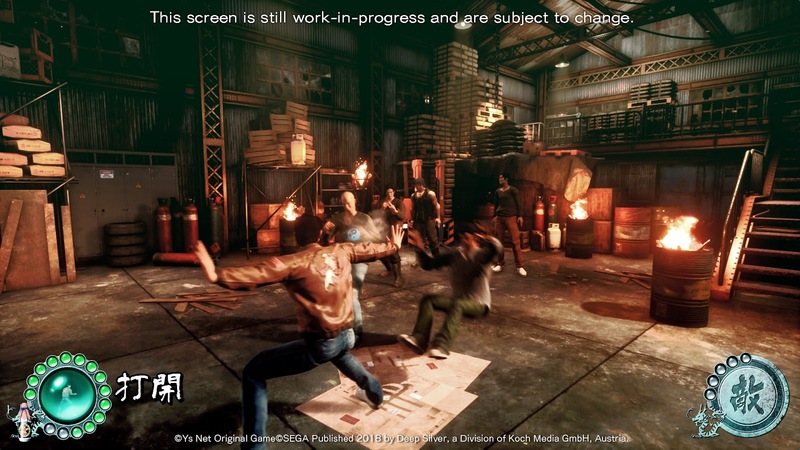 (This concept is one that can be found in the Yakuza games Zero and Kiwami). 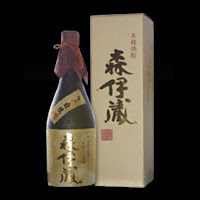 Alternatively - keeping in mind Yu Suzuki's reputation for innovation - it may represent a new concept that has yet to be revealed. 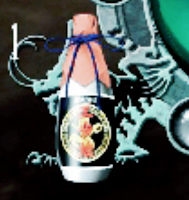 At the bottom left of the meter is an image of a small white bottle: it has pink paper fastened over it with blue cord around the neck, and a black label with a round design. To the left of the bottle is the number "1", presumably a counter representing the number Ryo has remaining. 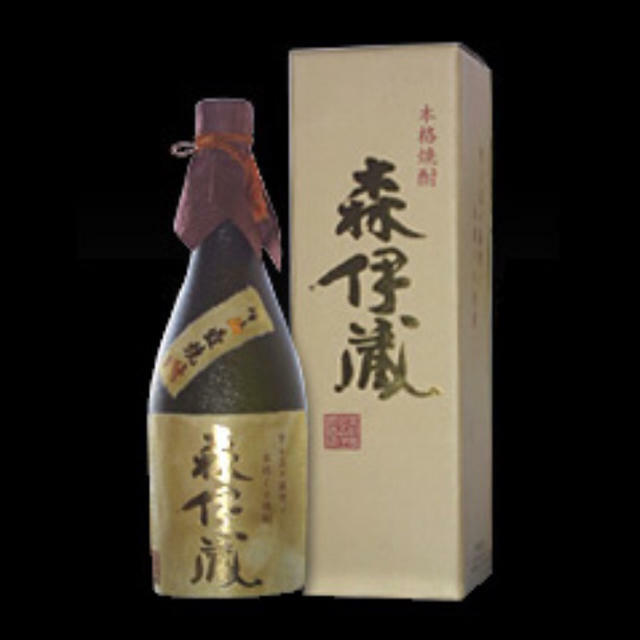 A bottle of alcohol with a similarly-fastened top. On the right side of Ryo's strength gauge, are two characters in large write lettering. Next let's examine their meaning. (My explanation of their meaning here will be based on the assumption that these are Japanese kanji characters, although it is likely that the meaning will also be very similar in Chinese). 開 which means to open. Together, they form the word 打開 (pronounced dakai in Japanese), which is a noun that means break-through. When used as a verb it means to break through, overcome or punch one's way through something. It can be used both literally ("The army broke through the enemy ranks") or figuratively ("We need to find a way to break through this stalemate"). I decided to carry out some online research to ascertain whether Dakai could be found as the name of a true martial arts move. 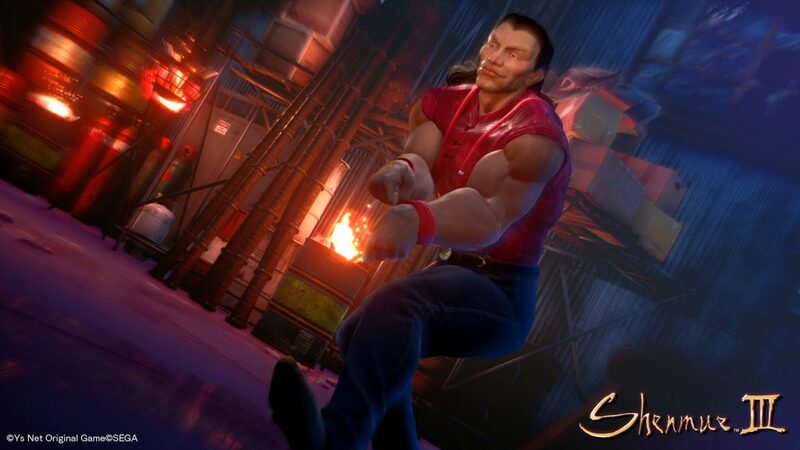 The obvious place to start looking was with the character of Akira in Virtua Fighter, the character from which Ryo Hazuki was derived and who also uses the Bajiquan fighting style. However a search of move names turned up nothing, leading to the conclusion that Akira does not have this move in his repertoire in any of the Virtua Fighter games. 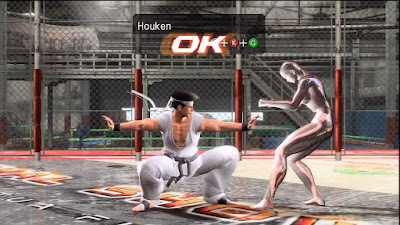 He does however have a move named Houken (=crushing fist), which was introduced in Virtua Fighter 5, and the form appears very similar; however in fact this move is associated with the Xingyiquan style. Better luck was to be had moving on to consider other games: the move Dakai can be found in a few existing fighting games. One such example is Street Fighter III, where it is one of the moves of the character Yun (the move name in English is simply "Dakai"). Furthermore, according to Yun's bio sheet, he practices Bajiquan just like Ryo. Street Fighter III: Yun performs "Dakai"
Researching further, this link between Dakai and Bajiquan was strengthened by evidence contained on a page from a Chinese-language blog on Bajiquan that carries a photo of the move being demonstrated. Significantly, the name of the move in Chinese uses exactly the same written characters as in Japanese: 打開. 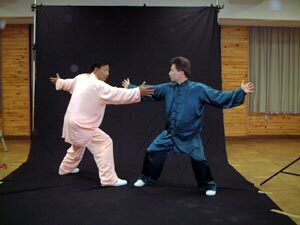 Photo of 打開 being demonstrated, from a Chinese-language blog on Bajiquan. Then, I came across some demonstration images by none other than Yu Suzuki's good friend and Bajiquan master, Master Wu Lianzhi. 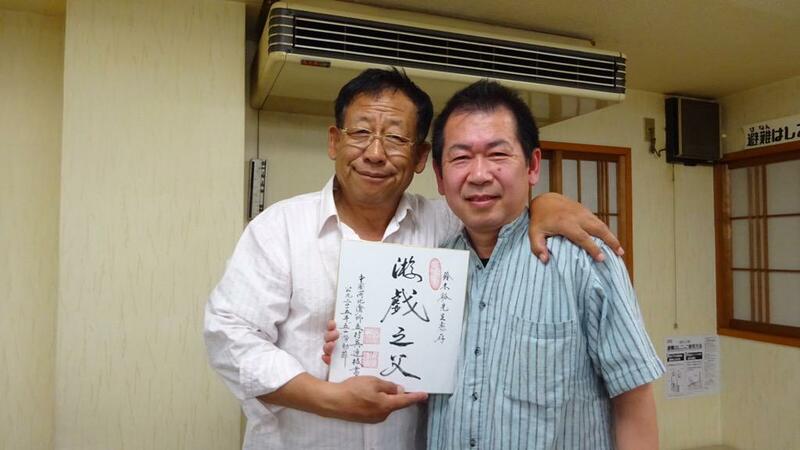 Yu Suzuki formed a friendship with Master Wu from the time of his 1993 research trip to China for Virtua Fighter and the two have met regularly ever since. One of the moves being demonstrated on Master Wu's website, as part of a photo shoot, is the very same move, labelled by name with the same Chinese characters. In conclusion, it seems likely that the name of the move Ryo is currently performing will be displayed on the screen as seen in the image. I wasn't able to find a common English translation for the move name, and it will be interesting to see how this name will be translated for the game. My proposal... how about "Vanquishing Strike"! 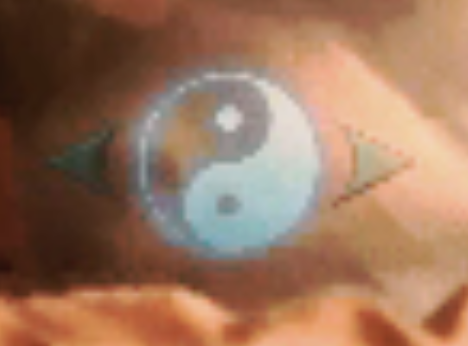 Floating above Ryo's arm can be seen a small yin & yang symbol. What could it be for? A clue may lie in the small arrows on either side of the symbol. 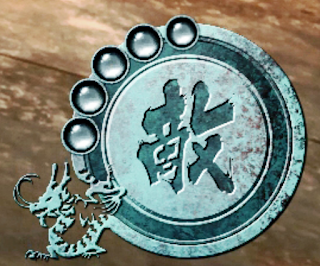 It has been suggested on the Shenmue Dojo forums that this may be a selector that allows the player to control the target of his attack. "Forklifts... if I don't include them, everyone will be upset with me. 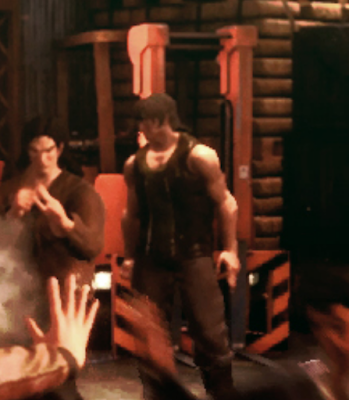 [laughs] Forklifts are being readied." Will the forklift be operational? This latest image gives us our clearest indication so far of how combat will look within the game. Questions come to mind such as what sort of environmental interactions will be possible, how the camera will behave and so on, which will no doubt be answered in future updates. As always, i was waiting for this post. This is great! Thanks for your support, Davisson! Any suggestion for how "Dakai" will be translated in the English version of the game? Yes, it would be fantastic to see some new material at Gamescom. Less than a month to go!